Can a waist trainer help you lose weight? We've worked with thousands of women over the years who are waist training, and we can confirm: a waist trainer doesn't magically melt your belly fat (contrary to some celebrity claims). The truth is, a waist trainer is only helpful in trimming inches off your waist when used as part of a weight loss program. We've heard from many women who combine waist training with healthy eating and exercise to shrink their waists. Here are some real before and after examples. Wearing a waist trainer can help reduce your appetite at meal times. It also "shapes" your waist into a more classic hourglass shape. The waist trainer essentially acts as an external LAP band, reducing the amount you can eat. "The corset physically restricts your stomach, and that can make it impossible to overeat," New York City nutritionist Brittany Kohn, R.D. told Shape Magazine. Again, waist trainers don’t melt fat … they simply redistribute it while reducing appetite at meal times. If you want to lose weight, exercise and eat your vegetables! If you decide to proceed from here, you can make the waist training process safer and more comfortable by following some basic rules. "Is your waist trainer causing you pain?" If the answer is a resounding "YES! ", then loosen it or take it off completely! The idea of no pain, no gain does not apply here. Slow and steady is the rule of thumb for waist training. Types of Waist Trainers - Which One is Best? Considering wearing a waist trainer? We've listed below the ones we recommend for getting started based on your body type and torso length. "Waist Trainer" is a generic term that refers to waist cinchers, corsets and other similar shapewear. 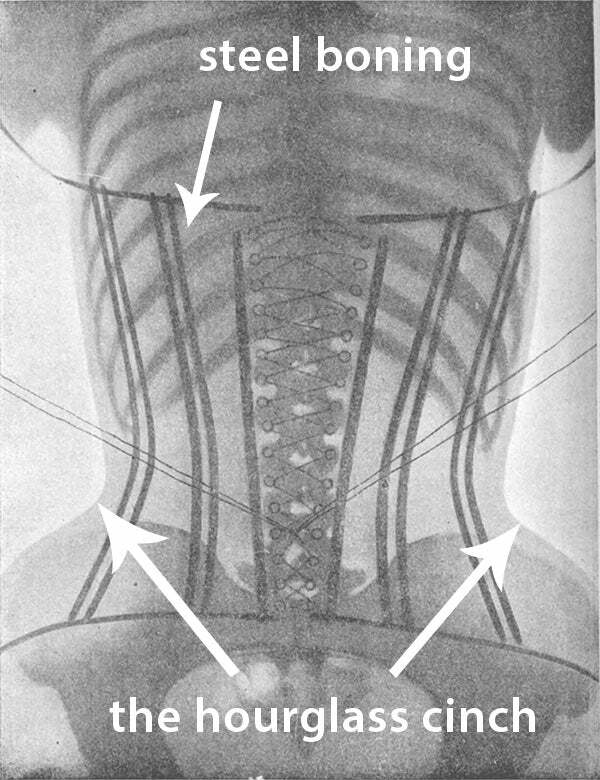 See here the differences between corsets and cinchers. A short latex cincher with strong shaping power. The shape memory latex helps in streamlining the abdomen, decreasing waist size, correcting posture and urging the bust upwards. Features: Inner and outer nylon and spandex lining. Color options. Best for: Average torso lengths with all levels of curve. An extra firm short waist cincher designed to nip the waist. Works great for short torsos. Use this garment to target your pooch or create an extra curve at your waistline. Features: Completely encased steel bones for increased support. Best for: Short to average torso lengths with all level of curves. A shape memory latex cincher that helps in streamlining the abdomen, decreasing waist size, correcting posture and urging the bust upwards. Features: Front hook and eye closure with 2 rows for customized comfort. Best for: Long torso lengths with all curve levels. The CS-201 is a ridiculously comfortable corset that "hugs the body" without an extreme cinch. And, because it is relatively short, it will fit most body types and torso lengths. The mesh is ultra breathable for comfort. Best for: If you are "hip-py" with a short torso (under 8") and lots of natural curve. Not Recommended: Women with less natural curve. The CS-411 corset is a popular style that will fit many shapes. It has plenty of curve at the waist, but is relatively short and does not require an ample hip. The mesh is breathable for wearing comfort. Best for: Most body types. However, you need at least a moderate amount of curve to fill it out. Not Recommended: If you have an extreme athletic build or very low waist to hip ratio. The best-selling corset style, the CS-426 features an extremely contoured underbust and longline length that extends down over the hips for most women. Satin is the best fabric for wearing under other clothes. Not Recommended: If you have a short/standard length torso. You need a longer torso to make this corset work (as well as ample curve at both ends). So how long until you see results? The answer is ... it depends. We've put together a little video below that helps answer this question. Make sure you get your size right. Poor fitting waist trainers are uncomfortable, and wearing a trainer that’s too small won’t get you results any faster. Find a waist trainer that fits your body type. Waist trainers come in many different styles designed to fit different body types. Here’s a corset style guide. You’ll be more comfortable, and get better results, in a waist trainer designed for your body type. Only wear your trainer 1.5 – 2 hours the first time you wear it. Repeat this step several times over the first several days of breaking in your waist trainer. This applies not just to those who wish to waist train, but also those people who have purchased a corset for a special occasion like a wedding or event. Listen to your body and take it slow! If you plan on waist training, the keyword is “gradually.” Don’t tighten to the point where it’s painful. We recommend gradually increasing your time from 1.5 hours a day to around 6-8 hours a day over the course of 10-14 days. Take your time getting the trainer down tighter ... don’t rush it! We know you want to see your results TODAY, but you risk hurting yourself if you try too much too soon. See our full list of waist training tips here.